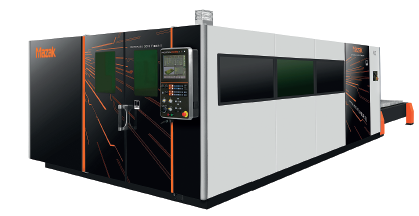 The last three years have seen significant change in Mazak’s laser business across Europe, not least the decision to combine the division with machine tools. 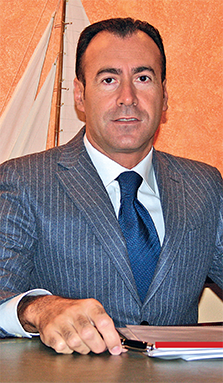 We meet Gaetano Lo Guzzo, Director Mazak Laser Europe, to find out more. Three years is a long time in laser cutting and Mazak’s performance over this period proves the Mazak brand is becoming a real force in the sector. Laser sales grew by 188%, and the number of countries actively selling laser has increased from five to 13, with the same number of Technology Centres now showcasing laser equipment. What’s more five distributors now cover new territories including Sweden, Norway, Finland, Baltic countries, Spain and Portugal. “It was already well known that Italy was the country in which Mazak laser products were more successful and we hoped that the same methods would give the similar results when applied to European market. “The unification with the machine tool division brought very good results, although there is still work to do to achieve the perfect synergy. Crucially, our Headquarters in Japan is convinced that the laser business growth is a great benefit for the company from a technical and commercial point of view”. We come now to a technical point, asking Mr Lo Guzzo about the specific benefits derived from the technical solutions and the commercial re-organisation. “Our sales re-organisation could not achieve these results without appropriate technology support regarding our laser products. “The first action in this direction has been the expansion of the laser product range that we could offer to the market. In just a few years we developed and launched the OPTIPLEX series, for different table sizes and available with either a CO2 resonator or fiber technology, along with the entry-level machine, the OPTIPLEX Nexus. The key for the success of these machines is the development of our own cutting head called “Multi-Control Torch”. The cutting head first ensures a perfect integrity against the particles produced during the laser cut. It is then possible to adjust the laser beam diameter in the focal point and its vertical position thanks to the controlled motion of the laser beam. “In this way we can optimise the cutting conditions for the different types of material and related thickness. All our cutting processing are therefore realised utilising only one focal length,” says Mr Lo Guzzo. Alongside, there is an automatic device for the nozzle cleaning and an automatic focal point measurement. 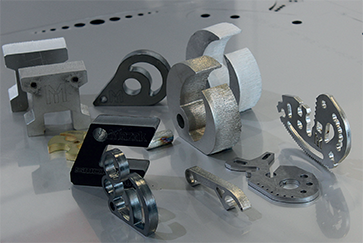 “In this way we have simplified the fiber laser cutting, which means it can now operate automatically to perform unmanned cutting operations on different material and thicknesses,” says Mr Lo Guzzo. He is keen to demonstrate the range in action and leads us into one of the company’s Technology Centres to view an OPTIPLEX machine equipped with a 6kW fiber resonator performing cuts on stainless steel and aluminum alloy sheet 30 mm thickness. The cuts performed are of excellent quality, with very little burr and with an acceptable edge roughness, far superior than what could be achieved by a CO2 laser. 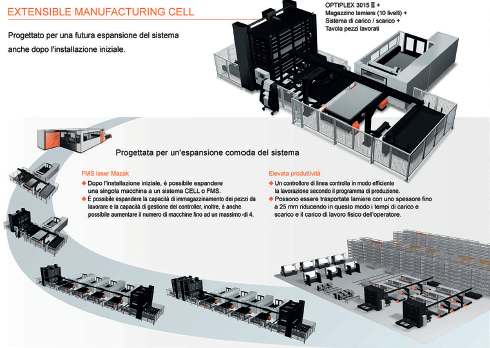 Mr Lo Guzzo is very keen to point out that all those innovations provided by Mazak, are matched well with the automation philosophy which guides the Mazak business and generates outstanding productivity and flexibility for customers. “From a productivity point of view it is very important to work 24 hours a day continuously in normal conditions rather than having peaks of operations in extreme conditions. Multiple laser machines can be integrated into one or more material stockers as part of a single FMS system.